Last week we were contacted by Mohi Arooni from Northern Iran about N. Tazetta’s that grow everywhere in his region. Since we traveled to the mountains of Spain and France, searching for species with Brian Duncan, I have been intrigued about what parts of the world that we can find wild species. I believe the tazetta Mohi is discussing is a species. Can you identify this tazetta using the photos and the description Mohi gave in the last paragraph? Here in northern Iran, we grow a type of N. tazetta with long, reflexed tepals which like most tazettas, smells incredible. Does this variety have a name? It grows everywhere, from parks to gardens and even abandoned houses in the countryside. Your description of the location in northern Iran suggests a species tazetta, possibility “N. tazetta subsp. tazetta”. It would help if you have photos and describe the colors, height, typical number of florets, etc. Thanks for your answer. I’ve attached 2 photos from our tazettas. Some may have up to 8 florets per stem. We have the regular wide tepal form in southern Iran which is also exported all over the country, but here in the north, the tazettas have very narrow, re-flexed tepals. 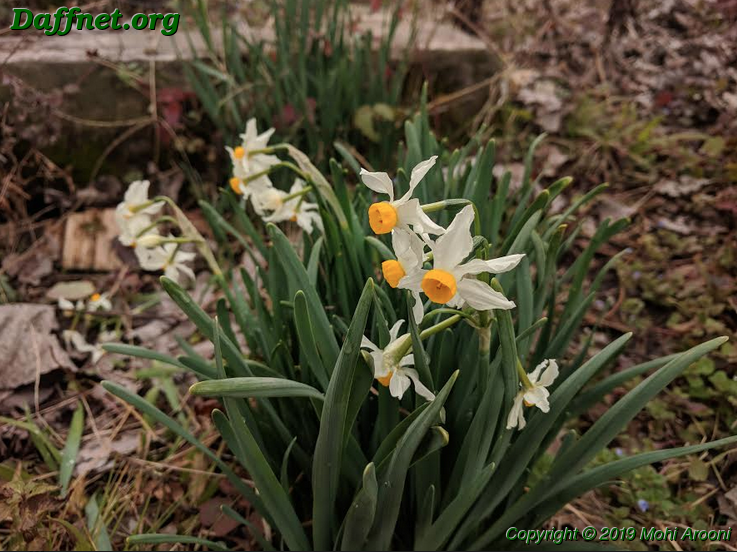 If you go to Dafflibrary and use the search tool to look for Daffodils in Iran, it will direct you to a short article about a daffodil festival in Behbahan. 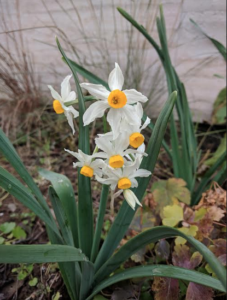 There’s a further link to a site which shows 24 photos, all of them looking to have white petals with yellow or orange cups. I didn’t find an identification on any of the photos. 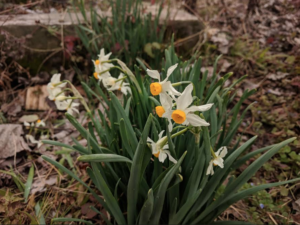 There is a Persian couplet about tazzeta daffodil “ I roamed a thousand years before I laid eyes on Nargis…… ( Persian name for daffodils). I used to remember it from when my father would recite it, but just remember the translation now. Can anyone identify this species Tazetta? Thanks for posting my ID request. I’m eager to find out what subspecies or cultivar it is. I’m not sure if it’s the effect of our humid and wet conditions on the the visual traits of regular tazetta or it’s a more permanent genetic issue. I’ve planted bulbs from southern Iran (wide tepal) last year to see whether or not those revert to the narrow tepal form. It would be classified as W-Y or W-O? with up to 8 narrow re-flexed florets per stem.